But NO. Incidentally I got to this website and started immediately download the iso image. The download process ran in Java and I had download speed about 800 KB/s, that's was very good speed. The image does have over 2 GB. I have burned it, restared laptop and booted from DVD. I had a Linux partition so I have just deleted that partition and made new with NTFS. I made this during installation process. Before installation I tested my laptop with Windows 7 Upgrade Advisor. My laptop passed only with CPU, which is over 1 Ghz (I didn't have a free partition on HDD). For the first time I got an error about some CD-ROM drivers. So I rebooted again and then installation process ran OK. Installation lasted for eternity, approximately 3 hours! But, it could be because my DVD-drive and small amount of RAM. At the end of the installation, when the first login window appeared, I removed installation DVD and system accelerated immediately. Dual windows boot was installed automatically. After first boot, of course no Aero theme. I did expect that, because Intel GMA has no drivers for Vista. There are some issues in hardware acceleration, Intel GMA is an old accelerator and in spite of requests of many users, there are no official drivers available. But I have no problem with that, I have changed the theme to classic neutral look. The Windows 7 runs very fast and smoothly on my laptop. Actually I'm writing this entry in Win7. I had no problems with connecting my camera through USB2, system has downloaded drivers for SoundMAX Audio and it could be used in seconds after installation. Everything works very well except this video driver. I do not plan to work with this system or play games, so it's not a big problem for me. Synaptics touchpad, battery meter, hibernation, DVD, my favourite Avira AntiVir, dual boot with WinXP work without problems. I was wondering about performance of Search engine. It is not like Spotlight in Mac OS X but it's fast and accurate. I don't see reason to buy Windows 7, because it has the same properties as WinXP for me. I can't use every feature because of my old laptop. 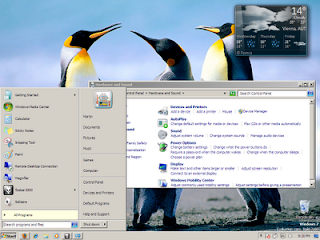 But there are many differences between WinXP and Win7, but for me and my laptop is WinXP just OK.